Ok, so Iâ€™d be lying if I said I havenâ€™t been singing that since August. Sadly itâ€™s true as I amâ€¦oneâ€¦crazyâ€¦Christmasâ€¦lady. Really I am. I started thinking about this Christmas around the middle of January. Paul has to stop me from putting the Christmas tree up in October and Iâ€™m practically banned from pulling out the Christmas album now, until at least the end of November. This is our first vegan Christmas. Eek! At first, I was feeling a little terrified at the thought of trying to preserve all of our usual foodie traditions but after a few (hundred) food experiments Iâ€™m feeling fully confident about nailing the old traditions and bringing in some new plant-powered ones too! So, this is a recipe that I started working on in the summer. (Yes my family have known for a while now that Iâ€™m completely bonkers!) I wanted a good long run up so I could check that the cake was good even after feeding it and letting it mature. It actually went perfectly well first time and I can honestly tell you that Iâ€™ve never had something more Christmassy pass my lips. Like ever. Itâ€™s truly yum. 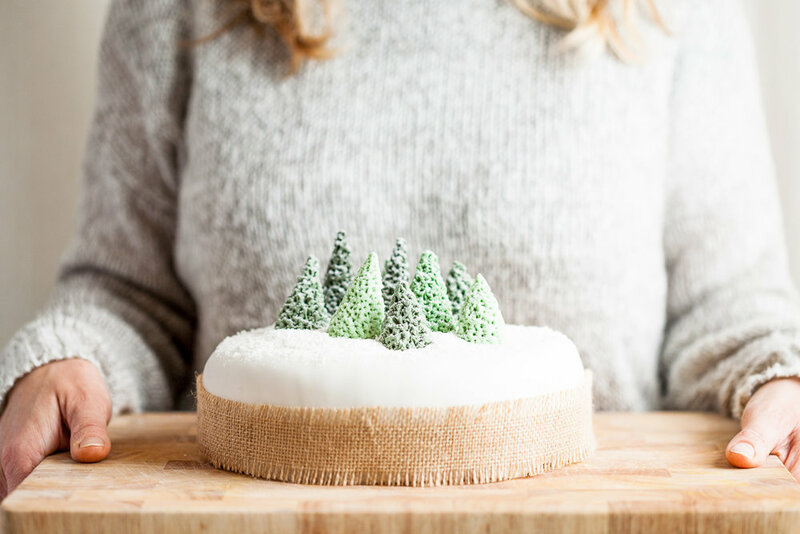 I know Christmas cakes can come across as pretty complicated but I assure you that this is a super, easy, peasy and straightforward recipe that you can make a few days before Christmas or up to two months in advance. Itâ€™s delicious either way. First, letâ€™s talk about how to make the cake and then I can talk you through the simple decorating techniques that I chose. So pop on Michael BublÃ© or your top Christmas hits from the 80s and get that wooden spoon ready as youâ€™re about to transform your kitchen into the gateway to Christmas. I warned youâ€¦crazy Christmas lady right here. Letâ€™s get startedâ€¦ For the cake base I used a 20cm round tin with a removable base but you can use square if you prefer. Now that your nostrils are filled with jingle bells and festive smells itâ€™s time for me to talk to you about the cake decorating. Now no matter what, if you decide you want to decorate straight away then make sure that your sponge is cooled and when I say cooled I mean COOLED! You donâ€™t want to waste all that hard work by having your icing melt quicker than a snowman at a barbecue. Ideally, you need to wait overnight but if youâ€™re like me and want it done yesterday then pop it in the fridge for a while. You should also wait a day between the marzipan and the icing stage but I have successfully done these stages just 6 hours apart. When your cake base is ready for decorating heat up a tablespoon or two of apricot jam and once melted brush on all over your cake top and sides. Lay your rolled out marzipan on top of your cake and using your thumbs first, tease the edges down until all of your sides fit snuggly around your cake. Then using your smoothing tool smooth the tops and edges. Cut off any excess marzipan. Set aside the cake for 24 hours. (Ideally!) When youâ€™re ready to ice, gently smooth a very small amount of water over your marzipan as this will help your icing stick. Place your rolled out icing on the top of your cake and gently use the smoothing paddle along the top and then down the sides, using your thumbs again to help find the edge of your cake at the bottom. (Be careful not to press too firmly as it may leave marks.) Smooth all over with the paddle until you achieve a nice finish. (Donâ€™t worry too much as most of the flat icing will be covered with snow and ribbon.) Cut off any excess icing and keep for the next stage. Now stand back and marvel at your beautiful Christmas cake. I hope you feel as proud as I did when I first presented this to some of our non-vegan family. It really does bring on faces of confusion and wonder in equal measure. Well done guys for bearing with me through this lengthy blog post. I have spent so many weeks perfecting this beauty so please feel free to ask me questions if you would like me to elaborate any details further for you. We hope you all have a truly fantastic Christmas from our family to yours. If you have any questions or comments, leave them down below, orÂ shoot us an e-mail!Â And, as always, if youâ€™re thinking about buying some of the items mentioned in our blog, use our Amazon affiliate links throughout this article or down below; it helps us create content that you like to read or that helps you out, and it costs you nothing â€”Â win/win! We appreciate the support.